Tropical Asia, including arid and semi-arid tropics, has a unique climatological distinction because of the pervasive influence of the monsoons. The summer southwest monsoon influences the climate of the region from May to September, and the winter northeast monsoon controls the climate from November to February. The monsoon brings most of the region's precipitation and is the most critical climatic factor in the provision of drinking water and water for rain-fed and irrigated agriculture. The El Nino-Southern Oscillation (ENSO) phenomenon, which is geographically very extensive, has an especially important influence on the weather and inter-annual variability of climate and sea level, particularly in the western Pacific Ocean, South China Sea, Celebes Sea, and the northern Indian Ocean. Suppiah (1997) has found a strong correlation between the southern oscillation index (SOI) and seasonal rainfall in the dry zone of Sri Lanka; Clarke and Liu (1994) relate recent variations in south Asian sea-level records to zonal ENSO wind stress in the equatorial pacific. The influence of Indian Ocean sea-surface temperature on the large-scale Asian summer monsoon and hydrological cycle and the relationship between Eurasian snow cover and the Asian summer-monsoon also has been substantiated (Zhu and Houghton, 1996). Several countries in this region have reported increasing surface temperature trends in recent decades. The warming trend over India has been reported to be about 0.57 °C per 100 yr (Rupakumar et al., 1994). In Pakistan, annual mean surface temperature has a consistent rising trend since the beginning of 20th century (Chaudhari, 1994). In most of the Middle East, the long-time series of surface air temperature show a warming trend. In Vietnam, annual mean surface temperature has increased over the period 1895-1996, with mean warming estimated at 0.32 °C over the past three decades. Annual mean surface air temperature anomalies over Sri Lanka during the period 1869-1993 suggest a conspicuous and gradually increasing trend of about 0.30 °C per 100 yr (Rupakumar and Patil, 1996). In general, an increasing trend in temperature has been observed in southern and central India in recent decades in all seasons and over all of India in the post-monsoon seasons. This warming has generally been accompanied by increases in diurnality except over northern India in the winter, pre-monsoon and post-monsoon seasons. Srivastava et al. (1992) observed increase in trends of annual mean, maximum and minimum temperatures south of 23 °N and cooling trends north of 23 °N. The diurnal temperature range (DTR) shows an increasing trend in all the seasons over most of peninsular India. This is in contrast to many other land regions of the northern hemisphere (Nicholls et al., 1996). Mean annual rainfall is considerably low in most parts of the arid and semiarid region of tropical Asia, and temporal variability quite high. In some places in the region, as much as 90% of the annual total is recorded in just two months of the year. Although, there is no definite trend discernible in the long-term mean for precipitation for the region or in individual countries during this time period, many countries have shown a decreasing trend in rainfall in the past three decades. In India, long-term time series of summer monsoon rainfall have no discernible trends, but decadal departures are found above and below the long-time averages alternatively for three consecutive decades (Kothyari and Singh, 1996). Recent decades have exhibited an increase in extreme rainfall events over northwest India during the summer monsoon (Singh and Sontakke, 2001). Moreover, the number of rainy days during the monsoon along east coastal stations has declined in the past decade. A long-term decreasing trend in rainfall in Thailand is reported (OEPP, 1996). In Pakistan, seven of 10 stations have shown a tendency toward increasing rainfall during monsoon season (Chaudhari, 1994). Chattopadhyaya and Hulme (1997) analyzed the trends in potential evapotranspiration (PE) for 10 stations in India including stations in arid and semi-arid tropics. In the monsoon and post-monsoon seasons, PE was found to have decreased over the last 15 yr over the whole country, whereas in the winter and pre-monsoon seasons the trends are less consistent. The decreasing trend in PE is up to a maximum of about 0.3 mm day-1 decade-1 over west-central India in the monsoon and post-monsoon seasons (Figure 1). These trends are generally lower than for surface evapotranspiration (Ep) and represent a reduction in PE of less than 3% per decade. Changes in PE were most strongly associated with changes in relative humidity, particularly in the winter and pre-monsoon seasons. In the monsoon season, radiation was the dominant variable for regulating the PE variation at nearly all stations. Changes in both radiation and relative humidity are associated with decreases in PE in the post-monsoon season. Figure 1. Mean linear trend (mm day-1 decade-1) in PE for the period from 1976 to 1990 for different seasons over India based on ten stations data. Dot size is related to trend. while few droughts occurred during 1930-1960 and 1980-2000. 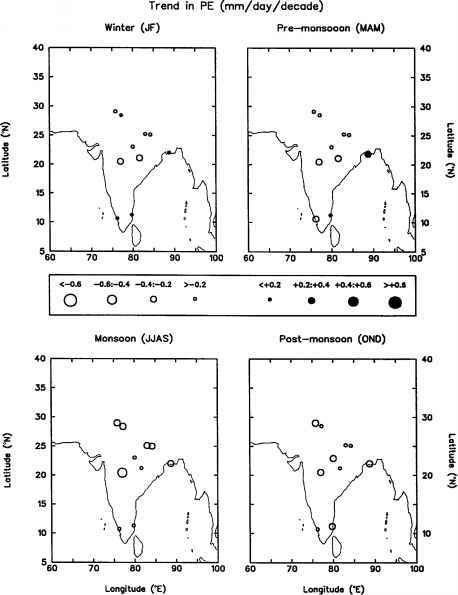 This suggests some kind of low frequency oscillation of the monsoon system on the decadal scale (Das, 2000). Gregory (1994) observed that over arid and semi-arid regions of India, there have been periods in the last decades of the nineteenth century and first two decades of twentieth century when drought frequencies have been markedly higher than in recent years, though individual recent droughts may have been intense ones in some regions. There are also reports of an increase in thunderstorms over the land regions of tropical Asia (Karl et al., 1995). The frequency and severity of wild fires in grassland and rangelands in arid and semi-arid Asia have increased in recent decades (Pilifosova et al., 1996). Low rainfall in arid and semi-arid regions dictates the formation of shallow soils, which are poor in organic matter and nutrients. Coupled with the conversion of grazing lands to farming, the arid region of India is undergoing an aggravation of desertification through erosion of lands and aeolian shifting of soil particles. In some locations, there has been a rise of water table with simultaneous increase of salinity and deterioration of soil regime. The variation of the aridity index line, computed by Penman method, over arid regions of India reveals a possible spread of arid conditions in the southeast direction (Jain, 1986). Populations in arid or semi-arid areas of south Asia are most vulnerable because of their heavy dependence on agriculture and high population density. Monsoon depressions and tropical storms are important features of the climate in this region from the agricultural production point of view. These storms can be destructive, but also are the main source of moisture. An estimated 31% of cropland is already irrigated, which may reduce vulnerability somewhat, provided water resources remain adequate. Chronic hunger remains a problem, however, for the poorer segments of the population particularly in semi-arid and arid parts of the region (IPCC, 1995). Africa is the largest tropical landmass with an east-west extent of about 6,000 km. It is the only continent, which has roughly equal landmasses within both hemispheres on either side of the equator. The vast continent is characterized by a wide range of climatic regimes. The poleward extremes of the continent experience winter rainfall associated with the passage of mid-latitude air masses. Over the rest of the continent, annual cycle is strongly determined by the position of the inter-tropical convergence zone (ITCZ), which is a primary feature of the meridional Hadley circulation (WCRP, 1999). The mean climate of Africa is further modified by the presence of large contrasts in topography and the existence of lakes across the continent (Semazzi and Sun, 1997). This basic climatic state is further significantly modified by the asymmetry of the continent, the adjacent ocean basins circulation, and the global Walker circulation, to produce the observed continental climatology (Hastenrath, 1985). Rainfall is one of the most important natural resources for many of mainland Africa's 48 nations (Hulme, 1992). Inter- and intra-annual variability in rainfall is perhaps the key climatic element that determines the success of agriculture in these regions, where the climatic control of soil water availability through rainfall and evaporation is most prominent. In low-rainfall years, there may be droughts; in highrainfall years or even for short periods in low-rainfall years there may be floods. Extensive droughts have afflicted Africa, with serious episodes since independence in 1965-1966, 1972-1974, 1981-1984, 1986-1987, 1991-1992, and 1994-1995 (WMO, 1995; Usher, 1997). The aggregate impact of drought on the economies of Africa can be large: 8-9% of GDP in Zimbabwe and Zambia in 1992, 4-6% of GDP in Nigeria and Niger in 1984 (Benson and Clay, 1998). African rainfall has changed substantially over the last 60 yr. Over tropical North Africa, this change has been notable as rainfall during 1961-1990 declined by up to 30% compared with 1931-1960. From an analysis of recent rainfall conditions in West Africa, Nicholson et al. (2000) concluded that a long-term change in rainfall has occurred in the semiarid and sub-humid zones of West Africa. Rainfall during the last 30 yr (1968-1997) has been on average some 15-40% lower than during the period 1931-1960. A similar, but smaller change has occurred in semi-arid and sub-humid regions of southern Africa. Dennett et al. (1985) pointed out that, though the rainy season includes June through to September in most of the Sahel, the annual rainfall anomalies are related primarily to rainfall in August and, to a lesser extent, September. Sivakumar (1992) showed that at several locations in Niger, a significant decline in the annual and August rainfall has occurred since 1966. From examination of the change between 1931-1960 and 1961-1990 in mean seasonal rainfall over Africa, Hulme (1992) showed that rainfall change has been dominated by the reduction in June-July-August rainfall in the Sahel with widespread decreases of well over 0.4 mm day-1. Such a large relative rainfall change between these two 30 yr climatologies is unparalleled elsewhere in the world (Hulme et al., 1992). Hulme (1992) also showed that in the Southern Hemisphere tropical margins, December-January-February rainfall rates have declined, with decreases of more than 0.4 mm day-1 over parts of Botswana and Zimbabwe. Nicholson et al. (2000) showed that mean August rainfall during the 1968-1997 period was 55, 37 and 26% below the 1931-1960 average in the Sahelo-Sahara, Sahel and Soudan zones, respectively. (ca. 120 km) between 1931-1960 and 1961-1990 and just under 3° latitude (ca. 330 km) between 1950-1954 and 1983-1987. Using normalised vegetation difference index (NDVI) data, Tucker et al. (1991) estimated a shift of up to 2.2° latitude (ca. 240 km) in the position of the 200 mm annual isohyet in the Sahel during the decade 1980-1990. A number of theoretical, modelling and empirical analyses have suggested that noticeable changes in the frequency and intensity of extreme events, including floods may occur when there are only small changes in climate (Wigley, 1985; Katz and Acero, 1994; Wagner, 1996). Mason et al. (1999) identified significant increases in the intensity of extreme rainfall events over about 70% of the country in South Africa between 1931-1960 and 1961-1990. Le Barbe and Lebel (1997) showed that the average number of rainy events in August was reduced by about 30%. Hulme (1992) categorized the possible causes for rainfall changes into three broad areas: those related to land cover changes within the continent; those related to changes in the global ocean circulation and associated with patterns of sea-surface temperatures (SSTs); and those related to the changing composition of the global atmosphere. Air temperatures in the Sahelian and Sudanian zones of West Africa (SSZ) are usually high because of the high radiation load. From south to north, temperatures increase and rainfall decreases. 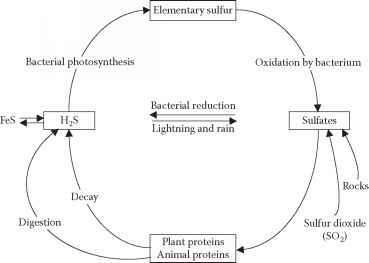 Environmental conditions during the stage of crop establishment in the SSZ, especially in the low rainfall areas, are usually harsh since the sowing rains follow a long and hot dry season. Mean maximum temperatures could exceed 40 ° C at the time of sowing and absolute temperatures could be much higher (Sivakumar, 1989). 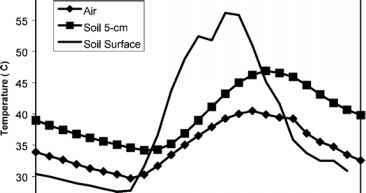 Diurnal variations in the air temperature and soil temperatures at the surface and 5 cm depth before the onset of rains (Figure 2) show that the surface soil temperatures can increase rapidly from 27 ° C at 0700 h to 56 °C at 1400 h. Although the surface soil temperatures decrease after a rain, with a short dry period and clear skies, atmospheric conditions can quickly return to those described in 2. The highland areas of eastern and southern Africa are substantially cooler than lowland regions, and there is evidence that recent warming trends may have been exaggerated in these mountain areas (Hulme, 1996a). The widespread deterioration of large areas of savannah in the semi-arid regions of Africa is believed to be associated with the overexploitation of marginal land via the removal of wood and overgrazing (Barrow, 1987). The net change of forest area in Africa is the highest among the world's regions, with an annual net loss based on country reports, estimated at 5.3 million ha, which contributes to 56% of the total destruction of forests worldwide. Because the open forests are mainly an unmanaged ecosystem, their regeneration may pose problems. Figure 2. Diurnal variation in the air temperature and soil temperatures at the surface and 5 cm depth before the onset of rains on 10 May 1992 at Sadore, Niger. Figure 3. Changes in the visibility from the 1960s to 1980s at Niamey, Niger (Data source: National Meteorological Services of Niger). is becoming particularly serious at the beginning of the rainy season, when rains are usually preceded by dust storms with violent winds. Moving sand particularly affects crop establishment by damaging the seedlings by "sand blasting" and the high soil temperatures during this period cause further damage. Lack of adoption of appropriate strategies at the farm level, especially in the Sahelian zone, to reduce wind erosion and sand blasting is leading to suboptimal plant stands and replanting over large areas. This has a feedback effect on land degradation. The existing climatic differences in South America are very great, climatic extremes such as the semi-arid, arid and desert are present in several countries. Due to topographic characteristics and geographical location, these climatic variations and their impact on economic activities and human beings are different from region to region. Even though air temperature in some regions is not a limiting factor, except in the southern portion of the continent, the lack of precipitation or its irregularity is a serious problem, specially considering agricultural aspects. Datsenko et al. (1996) analyzed the rainfall variations in the Brazilian northeast taking the city of Fortaleza as a reference. The study was carried out using the total annual precipitation data from 1849 to 1994. They observed that while the average air temperature tends to increase 0.57 °C/100 yr, a defined tendency of increased or decreased precipitation was not observed. Vergara et al. (2001) evaluated the precipitation trend in the 1921 to 2000 period in the northeast of the Pampa Province (Argentina), a region that is a transition area between moist and semi-arid climate which extends to the western portion of Argentina, with high vulnerability to fluctuations in rainfall pattern. For the period analyzed, a drought cycle with a peak in 1940 and lasting until 1960 was observed. Subsequently, a tendency for an increase in precipitation reaching a peak in the 1990s and with a subsequent stabilization was observed. Scian and Donnari (1996) analyzed the history of the droughts in the semi-arid regions of Argentina using historic data from 12 locations during 1930 to 1990. Use of various indices such as the Palmer drought severity index (PDSI), rainfall abnormalities, etc. permitted the consideration of the intensity and duration of droughts and it was concluded that the most severe drought affected the region from 1936 to 1942. Another severe drought period in Argentina was studied by Navarro et al. (1996). It was observed that 1995 was exceptionally dry, quantified both by the rainfall index abnormality and by the Hansen drought index. These indices indicated that for the region under study (Azul), since 1984 the precipitation levels were below the historic average, with a peak low decreasing until 1995. There are close to 20 regions in the world whose climate is affected by the ENSO phases, and Latin America is also affected with different characteristics throughout the continent. In Brazil the most affected regions are the northern portion of the Northeastern Region, the Eastern part of the Amazon (tropical zone) and the Southern Region (extra-tropical zone). The most well-known climatic abnormalities and whose impacts are largest are those related to the rainfall pattern, even though the temperature pattern may also be modified. During the positive phase, normally the northeastern region of Brazil shows an increase in the intensity of the drought with the decrease of rainfall, while in the south of Brazil the region is favoured by an increase in precipitation (Cunha, 1999). Martelo (2000) evaluated the impact of the El-Nino phenomenon in Venezuela observing that the precipitation pattern follows this parameter as well as the temperature in the North Atlantic. Olmedo (2000) evaluated the effects of the El-Nino in the Pacific coast of the Republic of Panama, observing that the effect of this disturbance is not homogeneous in the weather behavior. When El-Nino events are sequential, they observed that in general in the first year a reduction in the number of days and in the total amount of rainfall would occur, and an increase in these two parameters would occur in the second year. They observed that the most severe phase of the El-Nino would take place in the dry period of the second year (January to March), and in 1997 the average temperature registered was 2 °C higher than the average value for some months. Alves and Repelli (1992) analyzed the influence of El-Nino on several sub-regions in the northeast of Brazil, comparing the climatic contrast in El-Nino years in the abnormality indices of sea surface temperature (SST). They observed that there is a relationship between precipitation and the SST indices in the different phases of El-Nino, and that in both cases, there is a reduction in rainfall in the Brazilian northeast. Moschini et al. (1996), studying the effects of the El-Nino in the region of the Pampas (Argentina), observed a close relationship between the increase or decrease of rainfall depending on the warm or cold phase of the phenomenon respectively, which was also observed by Cunha (1999). In both the studies, the authors proposed agricultural techniques to mitigate the adverse effects of these abnormalities. Dias and Rebella (1996) evaluated the probability of changes in monthly rainfall patterns in the Pampas region (Argentina), due to El-Nino. They detected that in 78% of the cases the probability of rain in the 1961-1990 series increased when compared with the 1921-1955 series. Marengo (2001) and Marengo et al. (2001) analyzed the various conditions and forecast models of climatic changes in Brazil and Latin America and concluded that the study of climatic changes as well as the different scenarios to be determined need better qualification and quantification for Latin America. The authors emphasized that detailed studies of these aspects, which conclusively point out the changes or tendencies of average or extreme climate, that identify a regional warming, are scarce. Although in some regions systematic changes in rainfall or in temperature are shown, they attribute this to changes over 10 yr periods such as those which occurred in the Amazon in the period. Cunha et al. (2001) observed that in those years of the El-Nino phenomenon, the southern region of Brazil and part of Argentina and Uruguay are favored by above average rainfall. On the other hand, evaluating the El-Nino and La-Niña events from 1938 to 1998 regarding the barley crops, they concluded that in most cases La-Nina had a positive impact and El-Nino a negative one. correlated the SPI values with the productivity of the corn crop in Argentina. The correlation coefficient between SPI and yield was significant (r2 = 0.78). Dos Anjos and Santos (2001) evaluated the correlation between the SPI values and the El-Nino and La-Niña phenomenon for the semi-arid region in the Brazilian Northeast. They observed that in the phase in which these abnormalities had greatest impact were correlated with the values of SPI-6 and SPI-9. Through a system of dynamic monitoring, Solano Ojeda et al. (2000) determined the advance of droughts, the most affected regions and the crops that suffered the impact of this abnormality during the 1998 and 1999 period in Cuba. They observed that the frequent climatic abnormalities registered in Cuba in the last decades culminating with the 1998/1999 period, had a noticeable negative impact on all socio-economic activities. Among the adverse phenomena, drought was most outstanding, since it duplicated its chance of occurrence as well as increased considerably the extremes and intensity. Andressen et al. (2000) evaluated the changes in precipitation of the Bolivian high plains and the effects of these variations in the desertification and drought processes. Desertification in this area is highly relevant, since 41% of the area in Bolivia was subject to this phenomena (MDSMA, 1996, cited by Andressen et al., 2000). The authors also showed that the loss of productive land amounts to 1.8 million tons per year. The variations in precipitation observed in this period were large with amplitudes up to 5000% and with highly elevated inter-annual and special oscillation. Comparing the aridity index with the P/ETP, the authors concluded that for all locations of the Bolivian high plains, 75% of the months were classified as very dry or extremely dry. Silvia et al. (1991) observed that the rainfall distribution and the stability of the rainfall pattern in the northeast of Brazil are intrinsically related. By analyzing the annual values for temperature and rainfall in 34 locations of the Brazilian northeast and the humidity index terms according to Thornthwaite (1948), the authors concluded that there is not a strong correlation between the intensity of the drought and possible climatic changes in the arid region. A typical case of arid region can be defined through the evaluation of the conditions of the State of Rio Grande do Norte in the Brazilian northeast, located in the area of the Drought Polygon (Medina and Maia Neto, 1991). The study showed that the region above presented serious limitations for operational and profitable agriculture due to the long periods of drought. Even irrigation may be affected, if techniques for the preservation of the reservoirs are not adopted. The inter-annual and intra-annual variations for two locations representing the semi-arid and the sub-tropical regions are presented in Figure 4. During the El Niño years, rainfall is considerably reduced in the semi-arid regions, while in the sub-tropical area such a reduction was not so noticeable. Figure 4. Seasonal rainfall variability in a semi-arid region (Guruiu) and a sub-tropical region (Campinas) in Brazil. rainfall, responsible for maintaining the volume of the reservoirs and underground water.